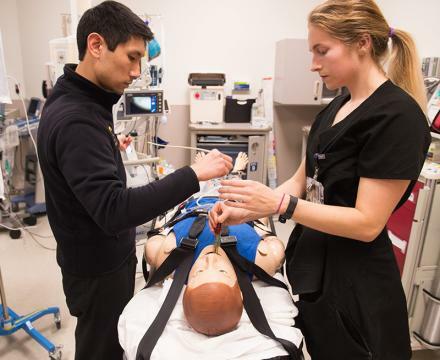 The Emergency Medicine Residency at the University of Iowa is an ACGME-accredited program that offers a uniquely comprehensive, challenging and individual experience in a collaborative and empowering environment. The state-of-the-art, 60,000 square feet Emergency Department contains 45 beds, and the 711-bed hospital serves the region as the only Level 1 trauma center and burn center in Iowa. The program also offers the premier Rural Emergency Medicine program in the country, the opportunity to participate in a Sports Medicine Fellowship at a Big 10 institution, and a comprehensive Wilderness Medicine course. Third-year residents are able to serve as flight physicians in Iowa’s 25-year-old Air and Mobile Critical Care Services Program. With a burgeoning patient census, in diversity and volume, residents receive abundant clinical experience that prepares them to perform in austere medical environments with minimal back-up. What is it like working in the ED?